Cross country skiing here in Blaine County ID has been so marvelous this December. Now that I am a Courtesy Patrol Person for the Blaine County Recreation Area, it’s even better because I get to meet all sorts of wonderful people. However, I must say that I do come home hungry; so tonight, I made myself the most marvelous dinner and one that I want to share with you all. I started the process this morning before I left for the trails and when I came home—it was a breeze to just stick in the oven and enjoy when done. 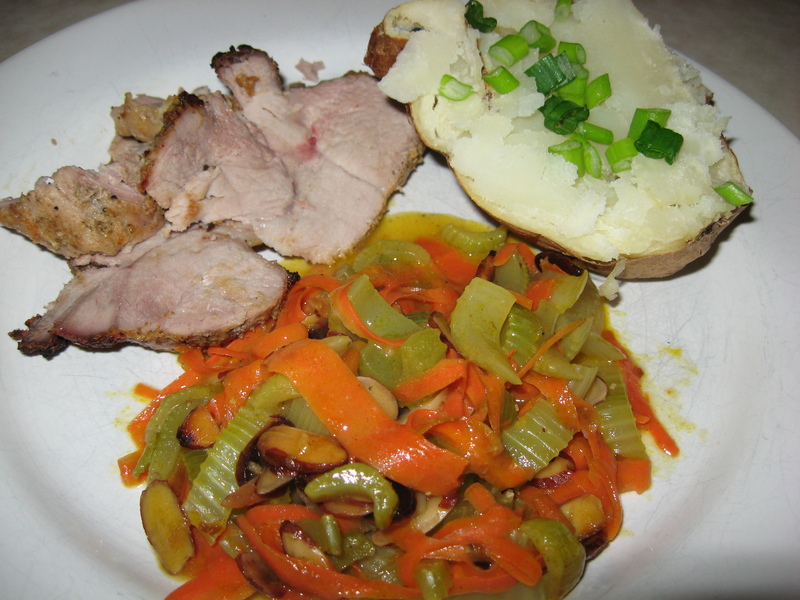 I also had some left over celery and one carrot which got me thinking about a nice veggie side dish. A baked potato to add and that was all that I needed. Perhaps a sweet potato or yam might have been more perfect—but I didn’t have that and I do enjoy baked potatoes. Make several sharp cuts in the pork—all over. Pam spray a large round Pyrex bowl and place onions on bottom. Then place pork on top. In a food processor, put the rest of the ingredients. (The orange, grapefruit and lemon juice should add up to 1/2 cup total of juice.) Process to make a nice marinade. Use only 1/2 of it for a 2 ½ lb. roast and save the rest for another roast, pork chops, etc. Best of all, even if your roast is 5 lbs., save 2 tsp. of it for the veggies mentioned here. Rub the pork, all over, with the marinade making sure that it gets into your multiple cuts. Cover with wrap and place in refrigerator for at least 4 hours. Now’s the time to go cross country skiing (or whatever). When you are ready to cook this roast, preheat over to 450. If you haven’t had time to remove the roast to get it to room temp, cook it at the 450 stage 5 minutes longer. If it is at room temp place the pork in the middle rack of the oven for 30 minutes. After the initial 30 or 35 minutes, turn down the temperature to 325 degrees and cook 30 minutes per pound total—until the internal temperature of the roast reaches 160. 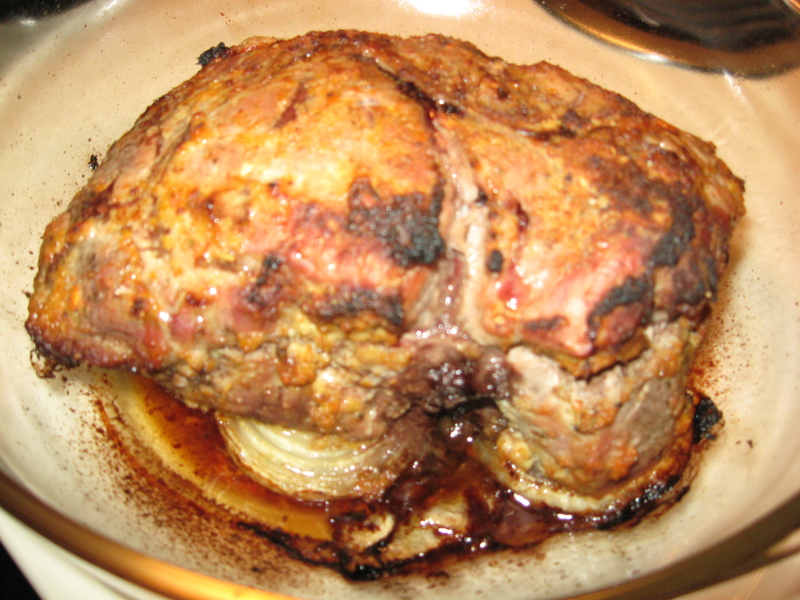 Remove roast from oven; allow roast to rest for 15 minutes before carving and discard onions. 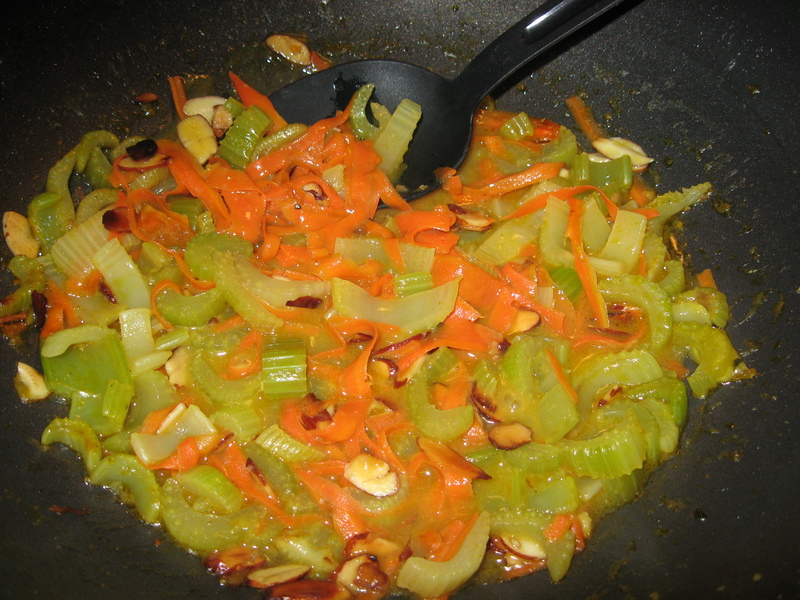 1/4 to 1/2 C. slivered almonds which you have lightly browned in 1-2 Tblsp. butter. Cook and stir the celery and carrots stirring for about 2 minutes. Season with S&P and sprinkle with flour. Cook, stirring for about 2 more minutes. Add the stock, marinade and soy sauce, stir, bring to a boil then turn the heat to low. Cover and cook until the celery is tender but still a bit crunchy (about 10- 15 minutes). Uncover and if you think that you have too much liquid, boil off some of the liquid. When the mixture has a saucy garnish, add the almonds. Perfection!! !